도 (do) is definitely one of the most commonly used particles in Korean and for beginners, it is basically introduced as the equivalent of too, also, and as well. It is attached to nouns and pronouns. My head hurts as well. But 도 is pretty much a colourful particle and it has a lot more uses you probably do not know yet. Hence, I prepared this note to tackle each of them briefly so at least you know what its other usages are. 나는 기차를 타는 것도 좋아요. I also like taking the train. It is not possible to attach 도 directly to a verb stem so we use the gerund form by adding –는 것. Another way to nominalize a verb is by adding –기 to the verb stem. It is similar to – 는 것 but they are not at all completely interchangeable. You can’t tell this to anyone. In here, -도 is attached to another particle –한테 (to a person). It means ‘anyone’ and should be used only with negative verbs. 아무 is a pronoun that refers to ‘any’ person, but it has some derivatives such as 아무것 (thing), 아무데 (place), and 아무 때 (time). Adding –도 makes them negative and in such a case, only verbs in negative form are used. By the way, we say 아무도, 아무것도, and 아무데도, but not 아무 때도. 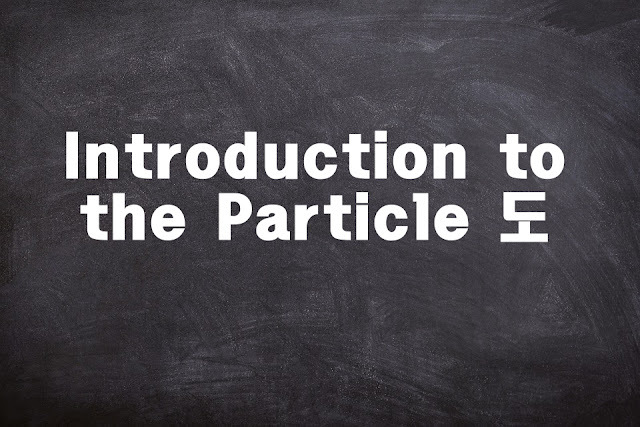 Actually, -(이)라도 is one separate particle but let’s have it included since it has –도 in it too. It is attach to nouns to express ‘at least’. Even if English is uninteresting, I have to learn it. The particle –도 is attached to the verb conjugated in its 아/어/여 form to mean ‘even if’ or ‘even though’. Even if English is interesting, I have to learn it. Basically, it conveys the same meaning as the previous sentence. We attach –ㄴ데도 to adjectives and –는데도 to verbs.